Merry Christmas! This is my gift to those of you who asked. I posted a picture of these biscuits on Instagram and everybody went nuts, so I decided to share my recipe. 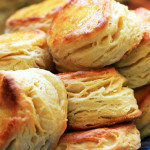 I like my biscuits many ways — flaky, not flaky, sometimes cakey, fluffy, sometimes drop’like — it all depends on my mood. 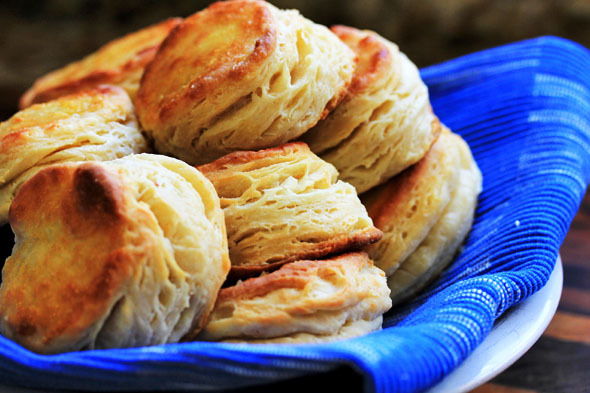 However, it’s always good to have a flaky buttermilk biscuit recipe in your arsenal. So, you’re welcome in advance and I hope you nail it. I tried my best to be as detailed as possible. I realize biscuit-making can be intimidating, but the concept couldn’t be simpler. As long as you remember one VERY important rule…KEEP EVERYTHING COLD AS F&#K. Seriously. Your warm balmy hands, and/or warm kitchen can destroy what we’re trying to build here — rising layers! Between every step, keep everything cold — I cannot stress this enough. Your oven should be super hot, so let it preheat for at least 30 minutes before baking. Oh, and keep everything cold lol. 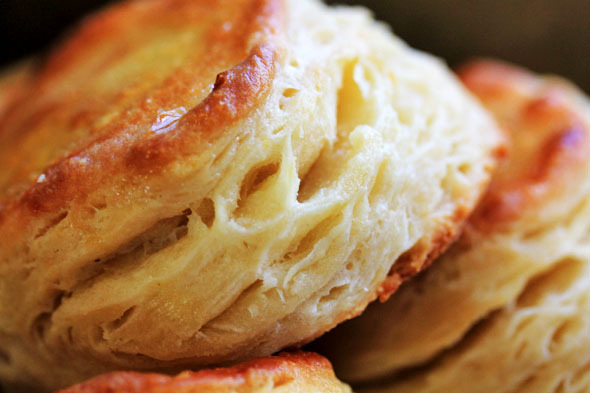 Your biscuits will still be soft and buttery, super flaky and very tender. You can literally peel buttery little layers back, it’s awesome. When you’re cutting the biscuits out, it’s super important that you don’t twist at the base. What happens is that you unintentionally “seal” the edges of the biscuit, so they don’t even rise properly. Also, make sure your cutter is nice and sharp. Don’t use the rim of a glass, the thickness of the edge will also hinder a proper rise. Make sure your baking powder is fresh, as well as your flour. Old ingredients don’t perform well. Did I mention keep everything cold? Especially the butter! 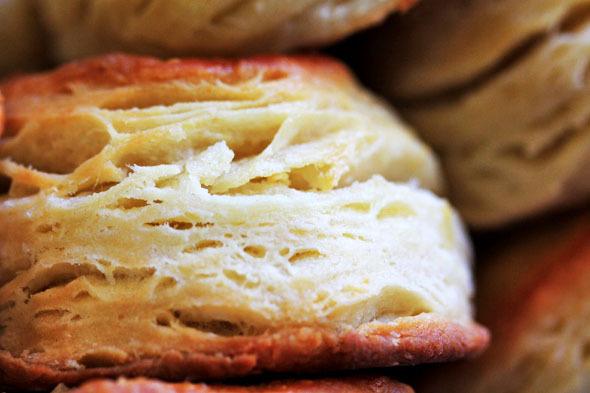 Butter is what helps give these biscuits their flaky layers. Butter contains water, and when that water is thrown into a super hot environment when it least expects it, it basically bursts and creates ethereal pockets of delicious sin. So once again, keep everything cold. Think of this as a really thick pie dough. We’re folding it several times because this causes the butter to flatten into thin sheets which helps give us those beautiful buttery layers. We are also giving the biscuit just a bit more body by developing a little more gluten. Don’t worry, they won’t be tough at all. The dough isn’t baby-bottom smooth like fresh pasta dough, it’s somewhat craggly but moist enough to hold itself together. All of this helps us with layers. Just remember that a dusting of flour between each fold shouldn’t be necessary, unless your dough is sticky. I had a small pocket of excess flour in one area of my dough and it caused 2 of my biscuits to rise all extra funky lol. I explain how to prevent this mistake at the very bottom of the post. Once you get the hang of this, you’ll be able to do it very quickly — which is a great thing. 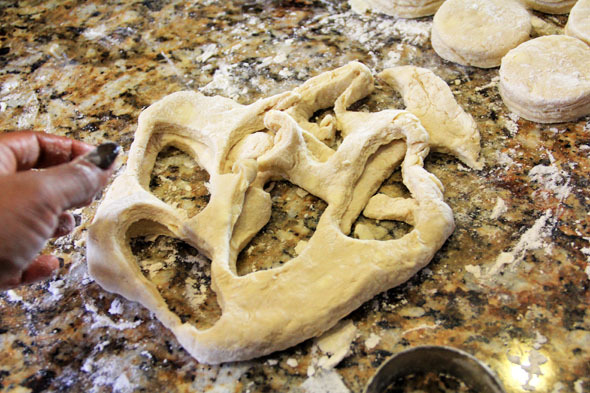 This isn’t the kind of dough you want to play around with for an excessive amount of time. The butter will start to melt and your warm hands and/or kitchen will ruin everything. 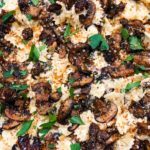 If you don’t have a food processor, you could use a pastry cutter, fork, or your fingers to break the butter up into pea-sized pieces or small flakes. Just make sure when you’re done with that step you chill the mixture so the butter can stay cold. 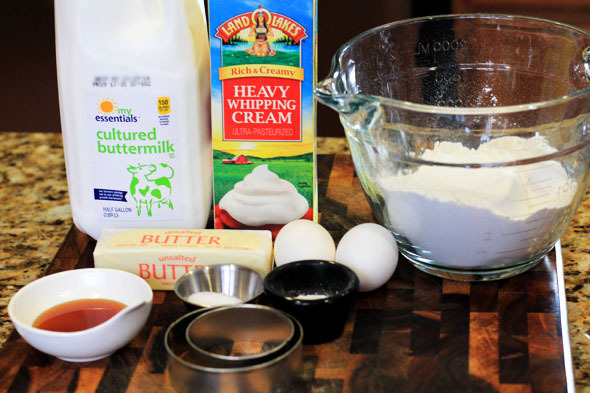 I am using FULL-FAT buttermilk here, which can be hard to find in some areas. It’s worth the hunt, though. You could always make your own buttermilk from whole milk and a little white vinegar. Google that recipe if you’re unfamiliar, it’s fairly simple. Some of you may be asking, “An egg? In a biscuit recipe?” Yes! Just trust me on this. It helps with the tenderness and color. Only one stick of butter is going into the actual biscuit dough, we’re brushing the tops with the other half-stick. 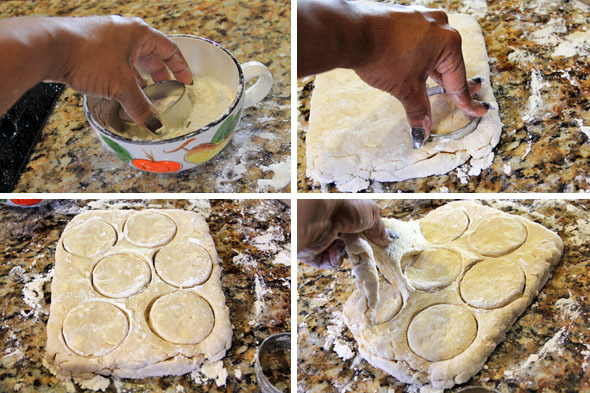 Use a very sharp 3″ biscuit cutter to yield 10-12 biscuits. Pulse the flour, salt, baking powder and *baking soda (if using). Then add the frozen cubed butter. Pulse 4 -5 times until butter is pea-sized. It’s ok if some pieces are a little larger. Don’t pulverize it though! Set this mixture in the freezer to keep cold. 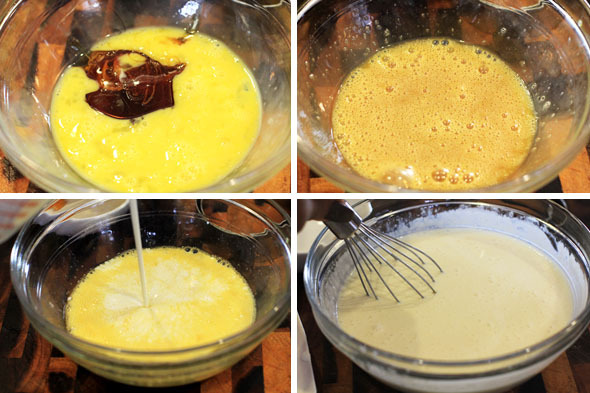 Whisk the honey with 1 egg until completely dissolved. Add the heavy cream and buttermilk and mix to combine. Set inside the fridge to keep cold! 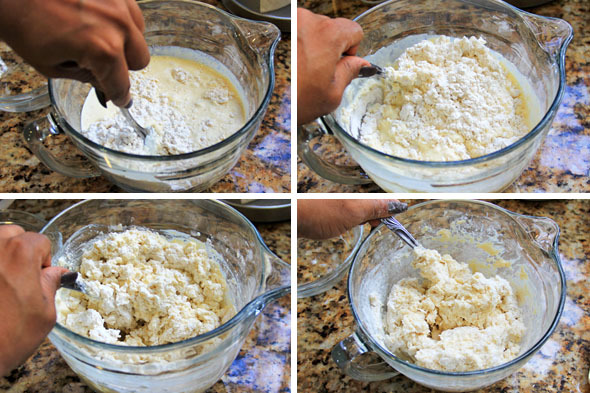 Make a well, and pour the very cold buttermilk mixture into the very cold flour/butter mixture. like this. Stick this in the freezer for 10 minutes to keep cold. Flour your surface and plop the very cold dough in the center. Bring the dough together into a uniform circle. 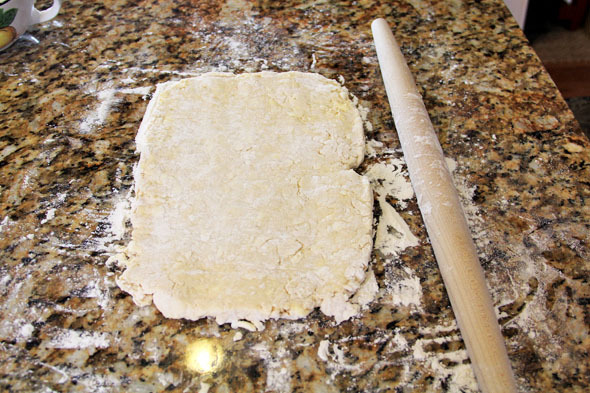 Flour a rolling pin and begin to roll it out starting from the center to form a rectangle. Use the edge of a bench scraper to keep it uniform if your hands are too warm. You should end up with a rectangle like this. 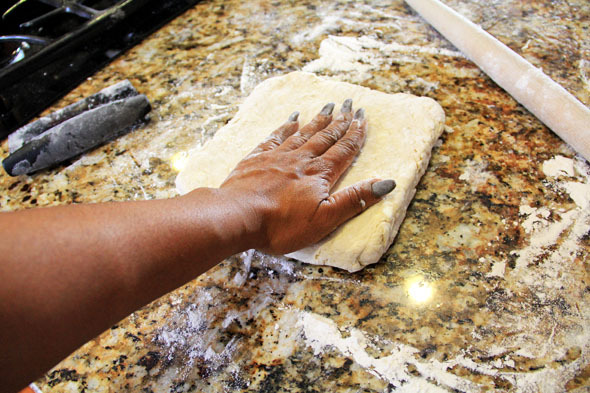 Your dough should not be sticking, but if it is, add a little flour so it’s easier to handle. I actually used a little too much here. Dust off the excess. With a bench scraper (if you have one) fold over 1/3 of the dough..
Then fold over the other 1/3, like it’s a business letter. Flip it over so the seam side is down. 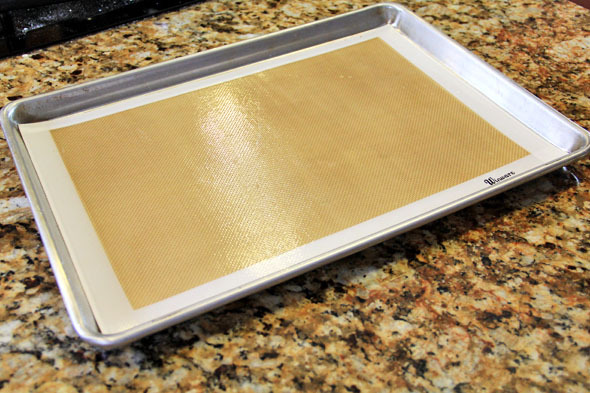 roll the dough out into another rectangle, pressing those layers together so that they’re sealed. 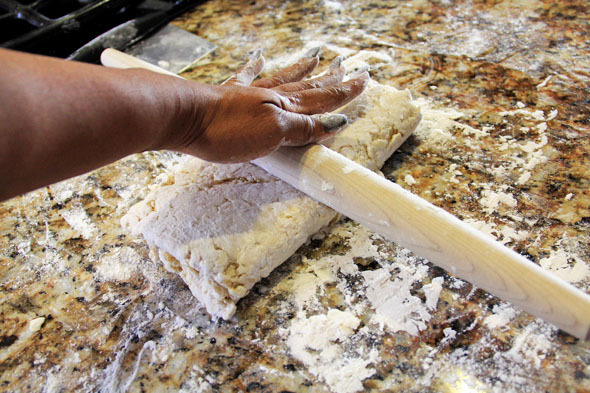 Keep rolling and turning the dough as needed until it’s in a rectangle. Then, fold half of the dough over. Gently press it to close it. Roll it into another rectangle. One last turn! Fold the dough over yet again. Roll it into one last final rectangle, about 1″ thick. Like this! Look at that butter in there, can you see it?? 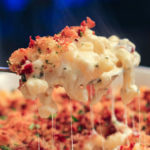 Pop this baby in the freezer for 5- 10 minutes. 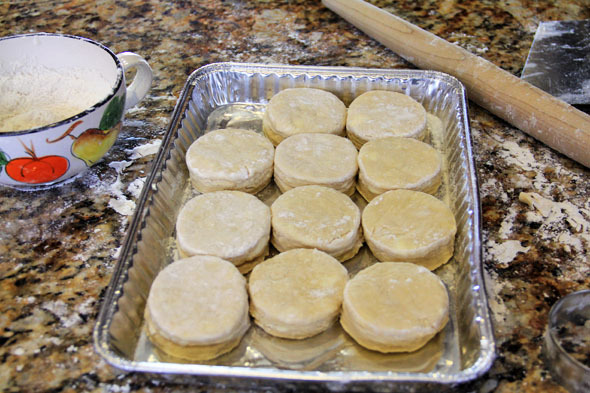 Dip your biscuit cutter in flour for EACH biscuit you cut. 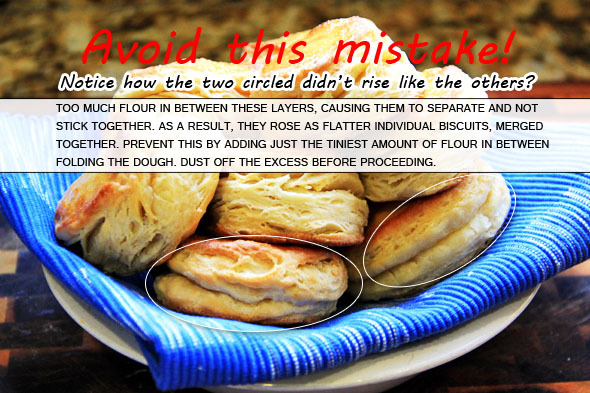 Stamp straight down, do not twist at the base — you’ll close the edges of the biscuits and they won’t rise. 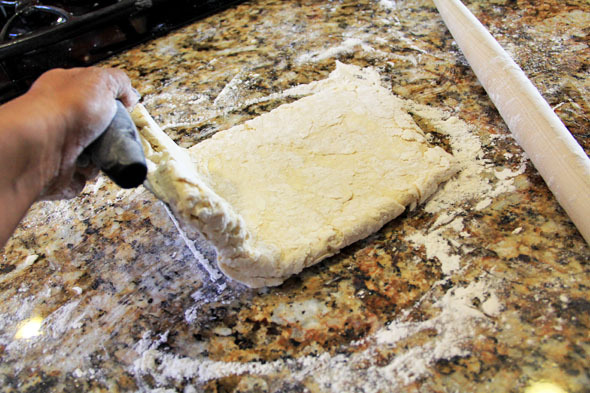 Lift the unstamped dough up away from the cut biscuits. Leftover dough, oh it’s getting used. Please believe that. 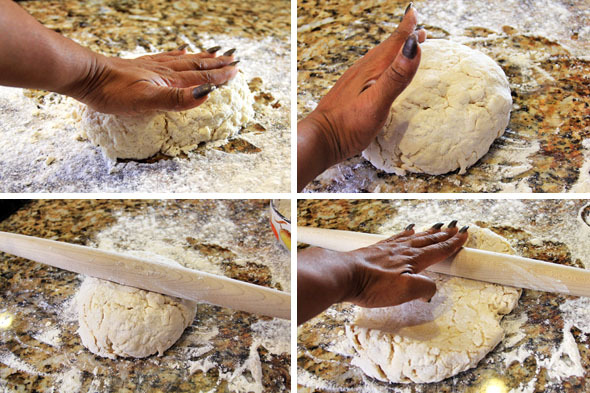 Bring the leftover dough together into a ball, roll it out, fold it over just once, and stamp out more biscuits. 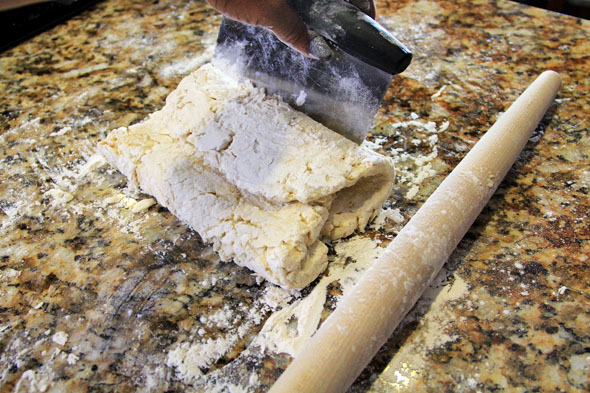 Dough can be re-rolled up to three times. Please keep it cold at all times. You should get 11 or 12 3″ biscuits out of the whole deal. Put them in the fridge or freezer to keep cold, about 10 minutes. 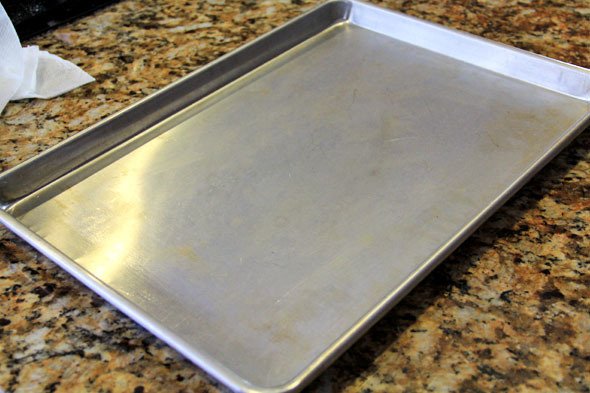 To ensure even cooking and no burnt bottoms, please use an aluminum baking sheet. 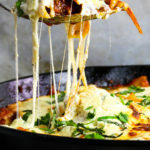 If you use a coated baking sheet, there’s a chance the bottoms will burn because those pans get hotter than they should. I’m also using a sheet of silpat. You can use parchment paper instead. Beat 1 egg, and brush the tops of each biscuit. Don’t let the egg touch the sides of the biscuit, it can seal the edges and prevent them from rising. If you decide to add the baking soda, you can skip this egg-wash step. Once they’re done, immediately brush them with warm melted butter. Here’s what the bottoms look like, just in case you’re curious. 9 out of 11 of my biscuits came out perfect, 2 of them came out looking stupid but still yum lol. Super easy recipe you guys.. 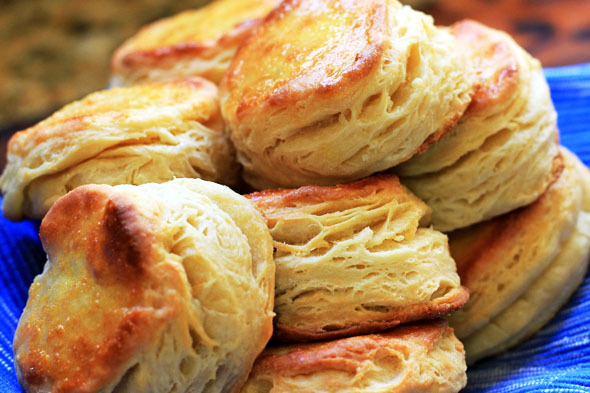 Enjoy and say goodbye to canned biscuits forever. You ready to do this? It’s easy, trust me. It may take you a few times to get this technique down if you’re a novice, but if you’re familiar, you shouldn’t have any problems. Preheat your oven to 400 degrees, middle rack in place. 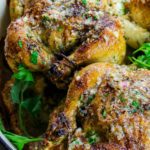 Your oven should be nice and hot, so let it preheat for at least 30 minutes. In a small measuring cup, beat 1 egg and set inside the fridge to keep cold. 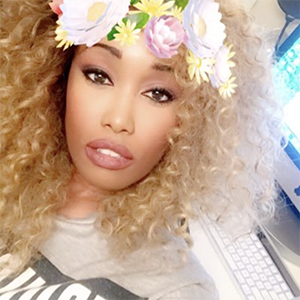 In a food processor, pulse the flour, baking powder, *baking soda (if using), and salt for 5 seconds. 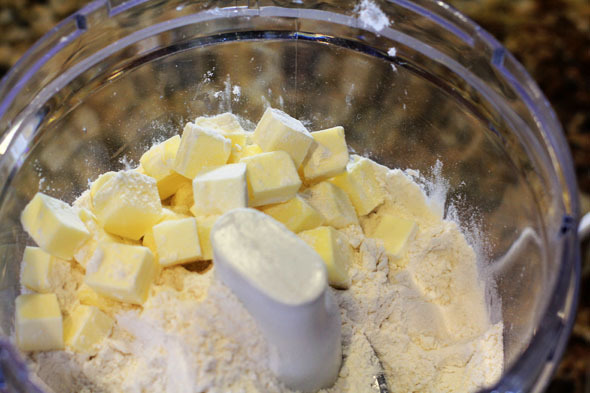 Add 8 tablespoons (1 stick) of cubed frozen butter to the flour mixture, pulse 4-5 times (1 second pulses) until the butter is relatively pea-sized, some larger pieces are okay. Transfer mixture to a bowl and set inside of the fridge or freezer for about 10 minutes to keep cold. In a medium-sized bowl, whisk 1 egg with 2 tablespoons of honey until honey is dissolved and no longer sticking to the sides of the bowl. Add the buttermilk, heavy cream, and mix thoroughly to combine. Set bowl inside of the fridge to keep cold. 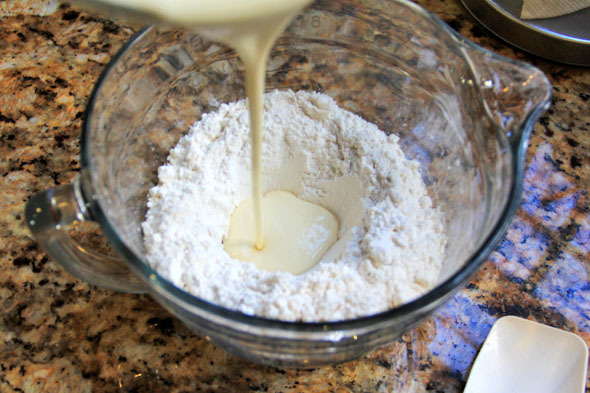 Make a well in the center of your cold flour/butter mixture, and pour the cold buttermilk mixture in the center. 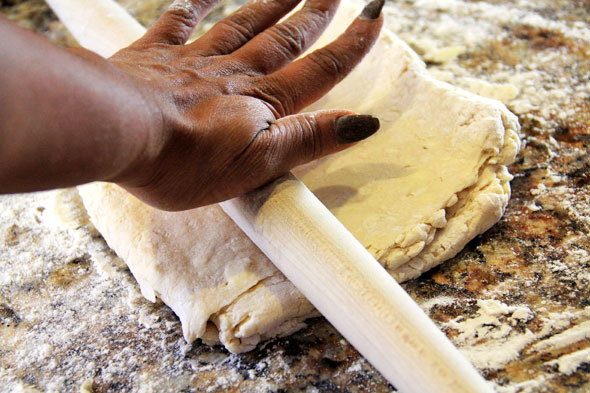 Using either a spoon or fork, bring the dough together until it’s craggly. Some light pockets of flour left are okay, but make sure it’s combined for the most part. 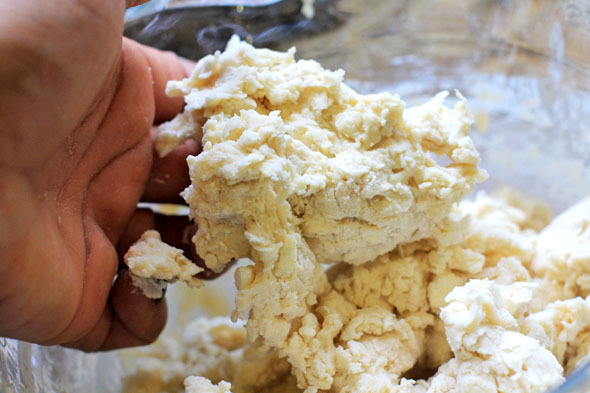 Place the bowl of dough in the freezer for 10 minutes. Dust your surface lightly with flour. 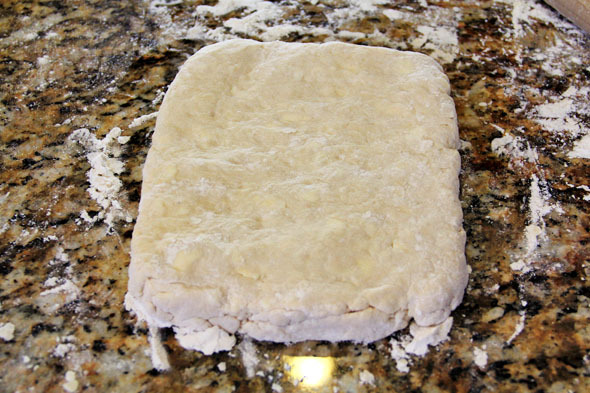 Place the very cold dough in the center, and quickly bring it together into a tight circle. 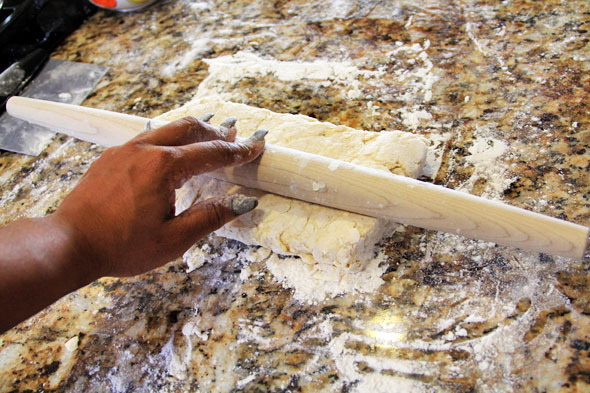 Flour a rolling pin, and begin to roll the dough into a rectangle, starting from the center. 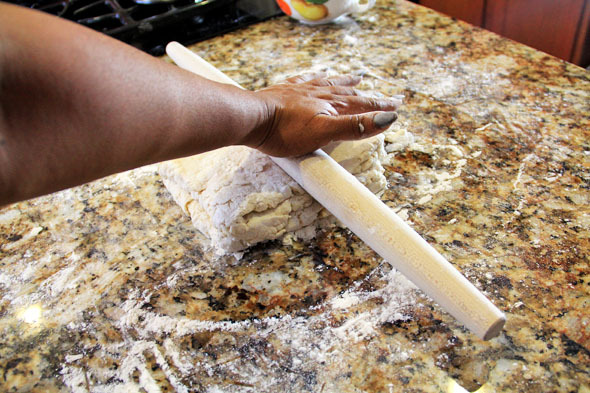 Do not press the dough too hard and don’t roll it too thin. If it starts sticking anywhere, add a little more flour to the area and continue. Once it’s in a rectangle, using a bench scraper (or your hands), fold over 1/3 of the dough to the center, and repeat with the other side. It should look like a business letter. 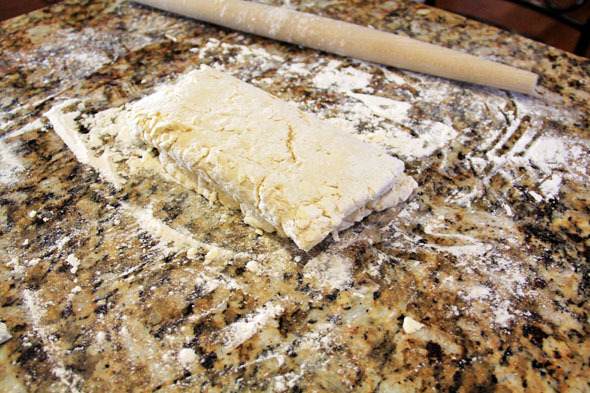 Flip the dough over so that the seam sides are down, and roll into another rectangle. 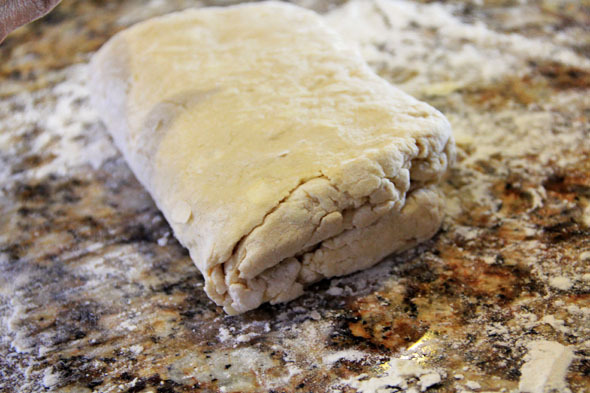 This time, fold the dough over in half (not in thirds), and roll into another rectangle. 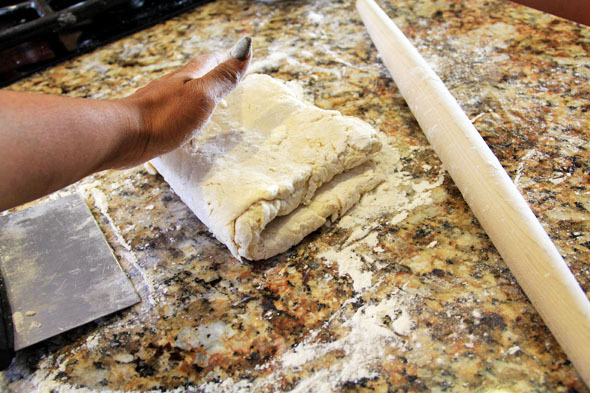 Fold the dough over ONE last time, into a rectangle. Pop it in the freezer for 10 minutes. Dip your biscuit cutter into some flour and stamp as many biscuits as you can, dipping the cutter back into flour for each biscuit. 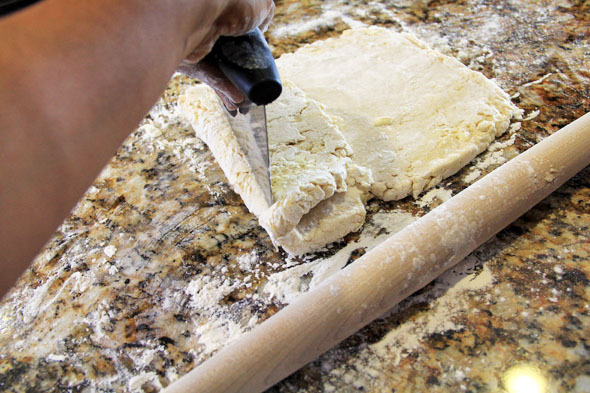 When you’re done, lift the uncut dough away from the cut biscuits. 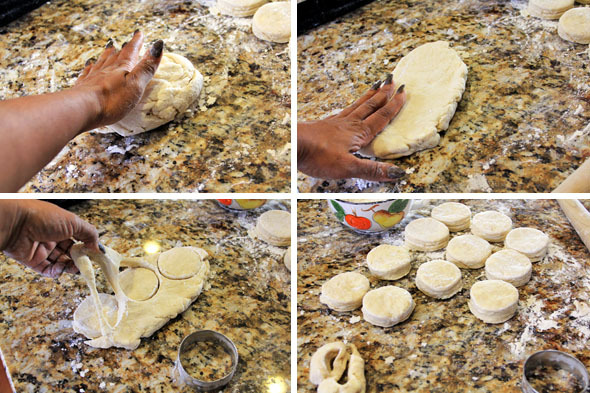 When handling the cut biscuits, don’t grab them from the sides — lift them from the bottom. 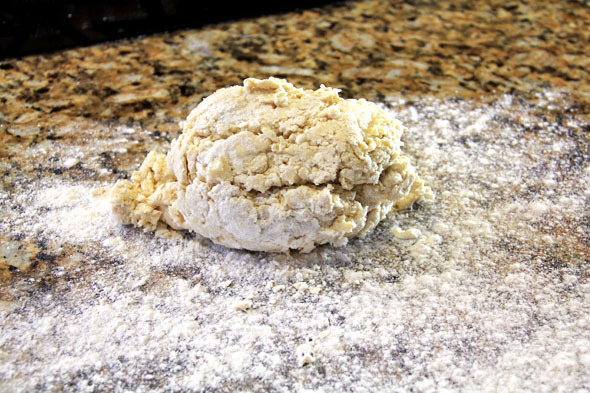 Re-work the leftover dough into a ball, flour it if necessary, and fold it over just once. Roll it out and cut out more biscuits. You should have 10-12 biscuits. 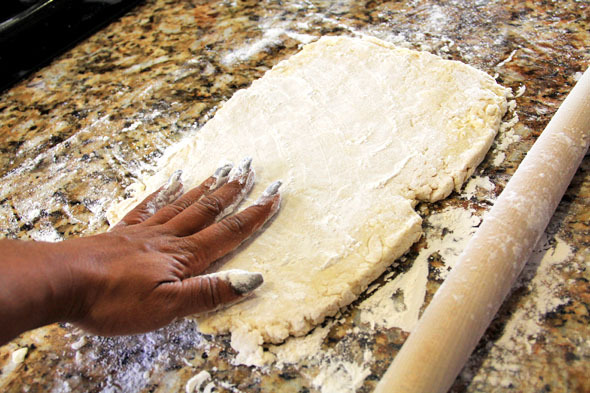 Keep cut out biscuits in the fridge as you continue to re-shape the leftover dough. Clean up your area. Place each biscuit on your baking sheet, about 2 inches apart. Brush ONLY the tops of each biscuit with the beaten egg you placed in the fridge. 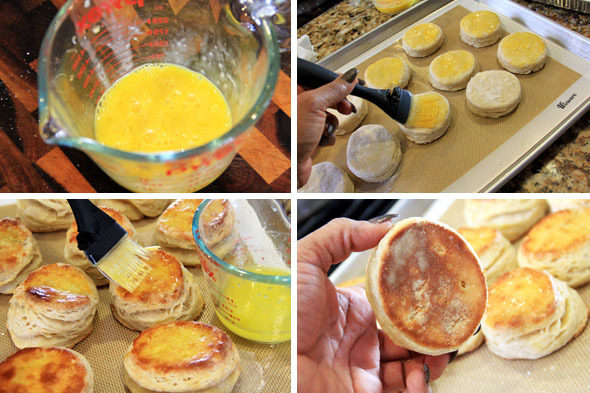 Don’t let the egg wash run down the sides of the biscuit because it can seal them and prevent them from rising. 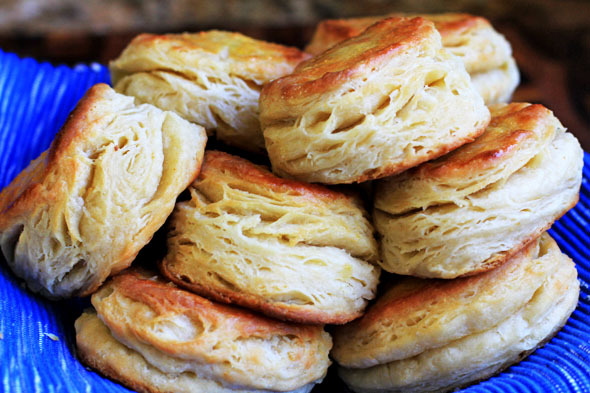 Bake the biscuits for 13-15 minutes or until tops and edges are golden brown. Immediately brush all of them with 4 tablespoons of warm melted unsalted butter. Make sure you get the butter down the sides of each biscuit into the nooks & crannies. Serve immediately. 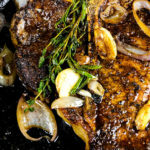 Baking soda is optional for this recipe. If you decide you don’t want to use an extra egg to brush over the tops of the biscuits before baking, add the baking soda to the dry mixture. 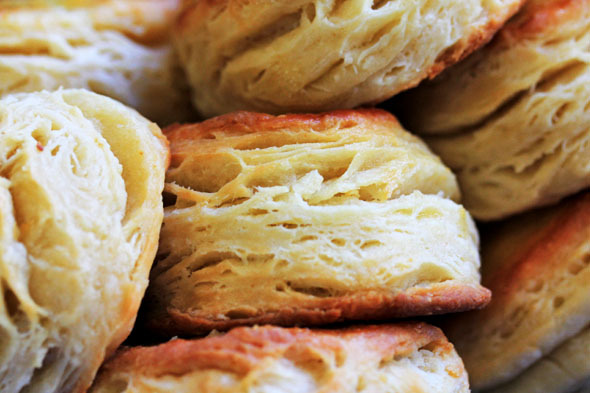 Baking soda gives the biscuits a beautiful golden brown top, no egg needed. The biscuits made in this recipe did not include the baking soda, but I’ve baked them with baking soda and no egg-wash and they still come out perfect. It’s totally up to you. If at any time the dough is getting too warm, pop it back in the fridge or freezer for a few minutes. Biscuits can be stored in an airtight container for up to 2 days and reheat well in a 350 degree oven for about 10 minutes or so. 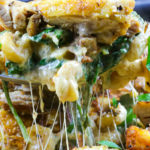 Recipe can be easily doubled. 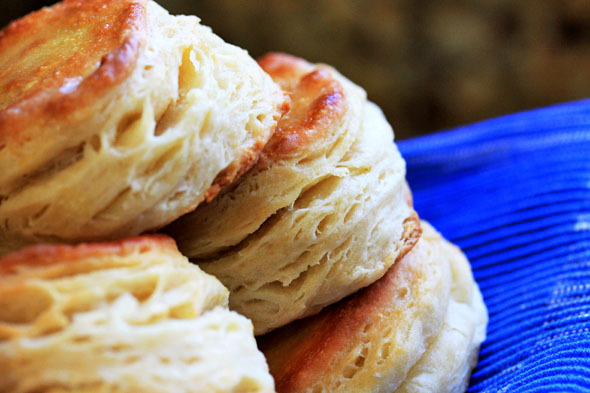 Store cut biscuits in a ziploc bag in your freezer and bake when ready – no egg-wash needed. Just pop them in a preheated 400 degree oven and let them do their thing. They come out perfect every time. You will need to add just a few minutes to the baking time, since they’re completely frozen. 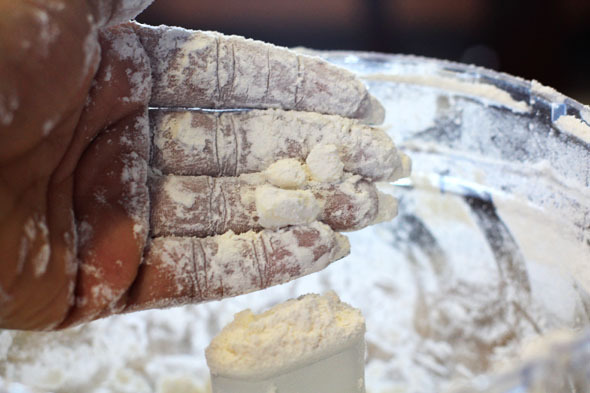 Avoid your biscuits rising like this by dusting off excess flour between each layer. Found your sight today because you are on Dr Oz. Watching now. Thank you. I’m trending a friend who has ALS now. She likes to watch Ellen & Dr Oz. But when I get home this evening I am looking forward to learning how to cook well from you. You nailed it. Thanks for the tips! Can you make the biscuit dough say, an hour or two, before you want to bake them?